Use it for a Handbag or a Small Shoulder Tote! Strip-pieced batiks are simply wonderful in this charming bag. Use the handbag every day or save it for special occasions. 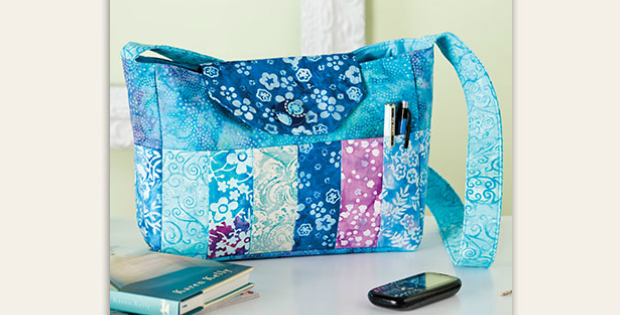 Or, fill it with quilting tools for toting to class. Pockets surround the outside of the bag, while a snap or button closure secures the contents. The bag is fairly simple to make yet is so beautiful and impressive when done. An (almost) monochromatic color theme works nicely in the bag shown here. Makes yours more scrappy, design around two or three colors, or stick with monochrome. The bag will be lovely in whatever color scheme you create. The finished bag is about 12″ x 9″ x 4″, excluding the strap. 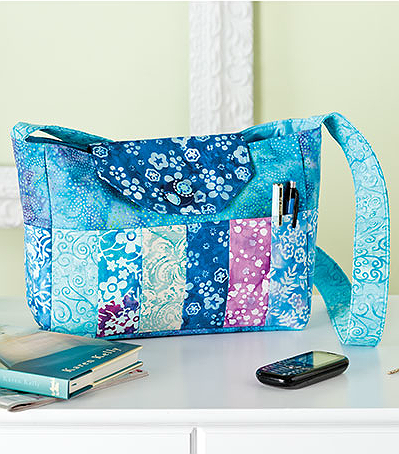 Click here to purchase the “Batik Bag” pattern.